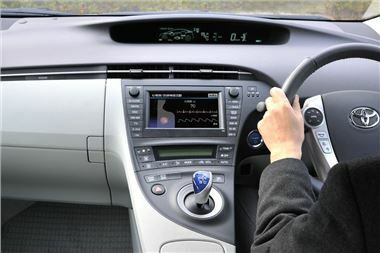 Toyota has detailed some of its latest safety technology, including collision avoidance assistance, adaptive headlights and a steering wheel which detects health problems in the driver. The focus of the new technology is the protection of pedestrians and older drivers, in response to figures gathered in Toyota’s home country of Japan which show more than half of traffic deaths are of people over 65, and that more pedestrians are killed in vehicle related accidents than occupants. One of the technologies is called ‘Pre-crash safety,’ or PCS, and is designed to brake if there is an obstacle ahead and the driver fails to do so on their own. It’s being further developed to help steer the car out of the way of stationary obstacles or away from the edge of the road if the driver goes off course. Toyota has also developed auto-dipping headlights, and is in the process of developing adaptive driving beam, which shields the high beam from oncoming drivers to reduce glare while still providing near the level of full high beam illumination. Black-outs and heart attacks at the wheel can cause serious problems to other road users, and so a system for monitoring cardio-vascular functions through the drivers grip on the steering wheel is in development. Toyota are researching this concept with the view of potentially bringing it to market. Pedestrian safety is being considered too, with a pop-up bonnet designed to reduce the risk of serious head injury should a car strike a pedestrian. The system works by increasing the distance between the bonnet and the engine, cushioning the impact of the pedestrian. Toyota is developing these technologies with research based on real crash data as well as in collaboration with hospitals and universities.